This “Arctic Blast” storm Oregon is experiencing makes the kids hungry. They are spending their days outside playing in our 15 inches of snow and then coming in every hour or so for hot cocoa and snacks. Like most kids, when they come in the first thing they ask for are cookies or candy… we have quite a few treats around right now because it’s Holiday time. I don’t have a problem with the kids having some treats, as I believe that healthy eating revolves around making wise choices and learning to eat in moderation. That said, I don’t want them to fill up on sugar. We’ve been enjoying lots of organic oranges, sliced organic fuji apples w/ peanut butter, organic bananas and organic baby carrots dipped in Organicville dairy free ranch dressing. In between the healthy snacks, we’ve had some gluten free/dairy free sugar cookies shaped like little snowmen, homemade hot cocoa and oatmeal no bake cookies. 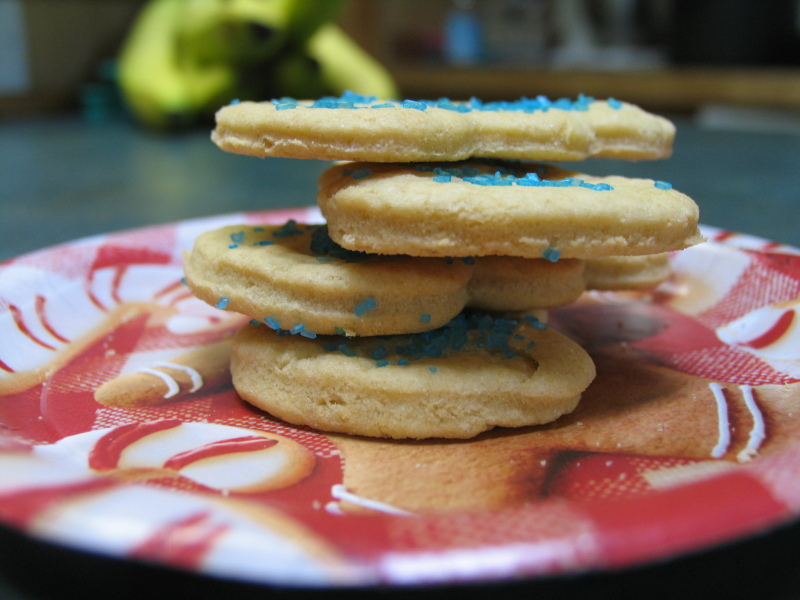 For the sugar cookie recipe, visit Karen over at Only Sometimes Clever. I cut her recipe in half and it still makes 4-5 dozen cookies. This recipe is full of healthy flours like amaranth, sweet rice and brown rice in addition to starch. This recipe does call for eggs, but works quite well when replaced with flax gel, applesauce or Ener-G egg replacer. We use enjoy life chocolate chips, grated Endangered Species Dark Chocolate Bars, Crushed Organic Candy Canes and India Tree Natures Color Sprinkles to decorate. This batch is all light blue sprinkled snowmen. Heat milk in a saucepan over medium heat. Once warm, add sugar or agave & cocoa. Mix well, continue to mix while heating. Do not boil. When desired temperature is reached (I check by sticking my pinky in, but choose your own method to prevent burns), add the vanilla, remove from heat and serve. We enjoy this topped with my agave marshmallows. Everyone’s had a no bake, right? They are fabulous… to make these Gluten Free, we simply use Bob’s Red Mill Gluten Free Oats (you can also replace the oats with Quinoa flakes). I usually double this batch… but we really like our no bake cookies. This is a slightly modified recipe of the one that has been in our handwritten cook books for generations (and probably in every cookbook on the planet). Place a large pan over medium heat, melt butter w/ sugar and coconut milk. Add cocoa and mix well, increase heat to medium/high and bring mixture to a boil for exactly one minute (this is important for cookies to set). Now add the peanut butter & vanilla, mix well. Continue to boil for about a minute, add oats or quinoa flakes, remove from heat and mix well. Allow to rest in pan for a couple minutes and then drop by spoonful (we make them on the smaller side so the kids don’t over do it!) onto parchment paper (if you have reusable pastry sheets, they work great as well!). Allow to sit until firm (should be ready to eat within 30 minutes). We’ve also been enjoying pumpkin and zucchini bread from the puree and shreds in our freezer, fresh baked whole grain breads, dried fruit and brownies with veggie puree hidden inside. But those are recipes for another day.